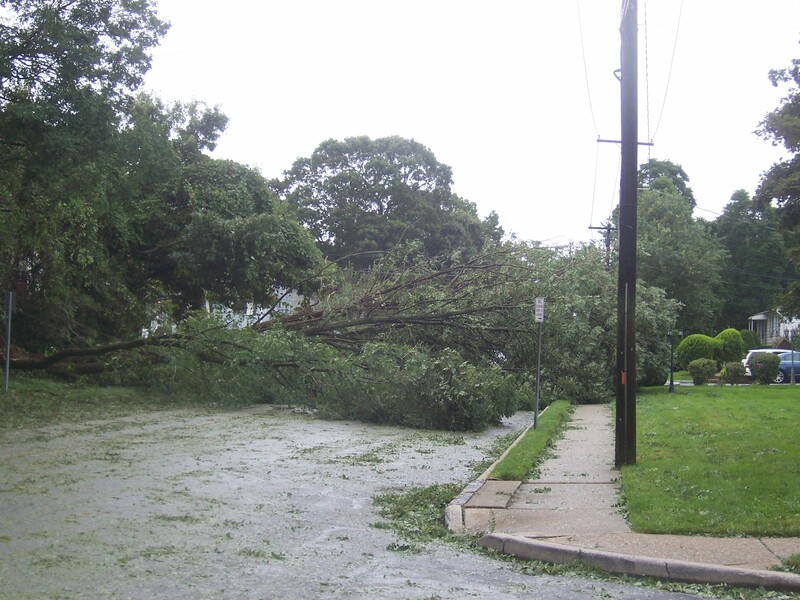 Around the corner from my house, a tree fell during Hurricane Irene, blocking the entire roadway. By fortune, the tree did not land on a car or a house or power lines. Had the wind shifted, had the break happened a little bit lower on the trunk, who knows what damage that tree could have caused. Still, there is something sad about the loss of a tree. As I looked at the site, I was taken by not only the enormity of the tree, but also by its age. They say that by examining the rings of a tree, you can see the tree’s life, when it was a wet year or a dry year. But the rings certainly can’t tell you what that tree came to mean to so many people; rings cannot tell you what any tree means to any person. Staring at the tree, I thought about the trees in my own life. There was the fir tree in the backyard, under which I would play with Matchbox cars and Tonka trucks, building roads so that a large root became an overpass. There was the maple tree in the front yard, which would ignite with fiery leaves each autumn. We would then rake the leaves into a huge pile and run and jump into the pile, or even have a leaf war with friends across the street. My friend Thomas had a tree that was perfect for climbing, giving young minds a wh0le new view of life in suburbia. My friend Bobby had a tree house, a simple platform high off the ground, a refuge from summer play and heat. Consider trees in your own life: initials carved in the trunk, proclaiming true love forever; planted to commemmorate a birth or a first Christmas or an anniversary or in memory of a deceased relative, friend, or pet; picnic blankets spread beneath them; a hammock stretched out for an afternoon nap. So many memories are held in the branches of our trees. Now the tree around the corner is gone. No more shade for people waiting for the bus. No more shelter for birds and squirrels. No more keeping a watchful eye on all of the changes that have happened in the neighborhood since it sprouted thirty, forty, fifty years ago. Imagine what that tree has seen in its lifetime: residents moving in and out, widening roads, overhearing conversations as people walked by. All of it gone in a storm. Now, it’s time to turn our attention to the personal “trees” of our neighbors, friends, families, and strangers. Personally, Joe and I were very fortunate in the hurricane. We never lost power, we didn’t lose any trees, we suffered no serious damage. Sadly, this is not the case with everyone. The news is now filled with images of Irene’s aftermath, and it is tragic. So many people have lost their very own trees: their homes, their livelihoods, their loved ones. And I hear that the government is moving funds from the folks in Joplin, Missouri, devasted by a tornado earlier this year, in order to help people in New England. The government is broke and broken. Who will save the American tree? I’m sorry to rant about this, but isn’t it time Congress gets called back from vacation? Isn’t it time to pass some kind of legislation or works program to rebuild not only New England, but also Joplin and any other locale that has faced a natural disaster? We have spent millions and millions of dollars to build/rebuild infrastructure in Iraq and Afghanistan. An independent report issued today states that 60 billion dollars was wasted in those countries as a result of fraud, corruption, and mismanagement. FEMA has only 800 million dollars to fund all of its rebuilding efforts. Where is the money for the homefront? For the American people who footed the bill for these countries, these wars, and the Wall Street bailout? Where is the quality assistance that so many people need so that they can have their “tree” back? Where are the ideas, the creativity, the cooperation? On the day of the storm, neighbors came together to help cut downed trees and limbs. My neighbor offered to take my pile of branches with his load to the town dump because I’m the neighbor who always retrieves his dog when it gets loose. If neighbors and communities can be brought together in the worst of times, why not political parties? I am not looking for a political speech, nor for a photo op of politicians and candidates, each one offering false promises and blurry ideas. I am looking for a government that can stop bickering on the petty issues, that can stop strategizing for the next campaign. Perhaps Washington, DC, should remember that “mighty oaks from little acorns grow.” It’s time to get back to governing, back to bettering the lives of the people who elected them in the first place — so that we can all grow. I don’t know. Maybe I’m naive, maybe I’m a bit of a Polyanna — but to me, this is just common sense. The last time I checked, weren’t we all part of the same family tree? I live in Tuscaloosa, Alabama where the tornado struck on April 27. We know about downed trees. We are having a campaign now to get trees to re-forest our town.. Much of the tornado area is like a desert. The only tree/shrub that survived is the crape myrtle. That sounds like a wonderful idea, to replace the trees that were lost. I am also hoping and praying that peoples’ lives will be put back in order, as well. Well Kevin we did have two beautifull Flowering Pears in front of the house. They were the nicest on the block. Irene left us one and thankfully didn’t drop the other on the house or cars. Glad to see that you’re back on the grid. In my neighborhood, Flowering Pears took a beating — but Maple trees were massacred. 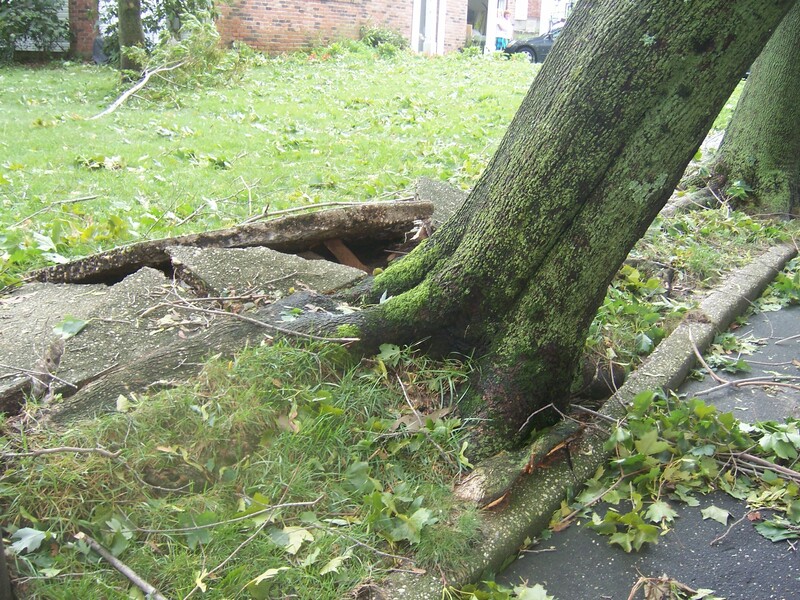 Good to hear that the tree didn’t cause any damage — just aggravation. The crew that removed the downed tree explained that the interior of the tree should be pruned to remove the third limb that forms in the fork. Much like a sucker branch on a tomotoe plant. Removing that branch enables wind to pass through and not act as a sail. We watched the riots on the news here. Things seem to be stretched to the max, like a rubber band. Maybe we all need to get back to the lessons learned in the garden: sowing, nurturing, tending, harvesting. You Tell them Kevin.LOL!All a bunch of children if you ask me. I think we need year limits on some of the dinosaurs in Washington also. Any how, I hate to see trees topple also. It takes them so long to grow and as silly as it seems you wonder what all they have seen through out the years. If trees could talk. LOL! Stuart has you all fixed on Blotanical now finally. Thanks for your patience. Hi Lona. Every so often, it all builds up inside and I have to let it out. Sometimes, weeding and tending to the garden isn’t enough to release the pressure. And also, thanks to you and Stuart for getting the Blotanical issue worked out. For anyone not familiar with Blotanical, it’s a growing community of blogging gardeners and gardening bloggers. Lots of wonderful ideas, advice, and photos. Please visit them. There is a link to it on the right side of the page. It is sad when a tree falls for whatever reason. For me, it is sad when it is an older tree. It seems that it took so much time and effort to grow that big and then it is down so quickly. I do hope things get better for everyone…it can be so frustrating. I agree. It really feels llike a life is lost. it is always a bummer when trees are lost… through what ever means. Absolutely. Trees truly enrich our lives — and it is a great loss when they come down. I remember when my neighbors first moved into their house, and they decided to remove many of their trees. It was devastating. Fine rant, Kevin, a sensible response to any government officials who have to debate whether to help people in such disasters. Thanks for the support. Sometimes just scratching my head isn’t enough.